Here it is no mucking around a freebie... Ok, ok so I got a bit clever and recreated a layout and turned it into a QP for you...hehehe. 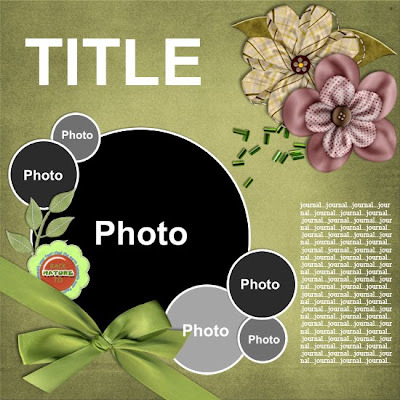 The QP is based on the Cut It Up template I made for the SDK January Challenge...DOWNLOAD HERE! We have a new Star in the gallery... welcome Charitycho to the SDK gallery! Looking through her layouts you will have to agree that this one is beautiful. I love the colours, with those patterns and that lace this is so romantic. To see more of Charitycho's excellent layouts visit her SDK gallery! Now again I haven't taken the FREEBIE sketch template down yet so if you haven't grabbed it yet GET IT HERE! I have been busy adding the past Supa Digi Kit bundles to the store... I must admit I have been a little lax in getting these kits up but all done now :) Boy what a bargain these bundles are, when you break it down you're paying just 50c a kit... what a great deal! Everybody wants to work...NO! NO! Not me! But I won't mind working too much on a layout with these delightfulkits. 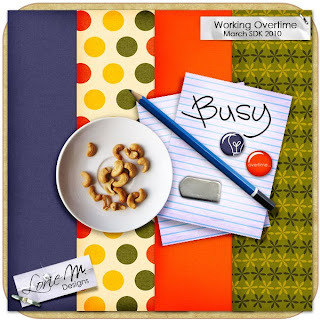 Rubber stamps, pencils, note paper, folders, and a snack or two all combine for those work or school layouts. 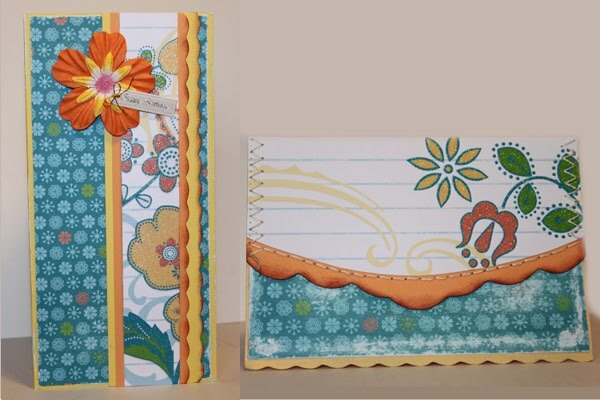 This is another layout using Nina's (aka NH Designz) Spring Flings and Easter Things kit by ZuzanaR. Aren't those photos just too stinkin cute, love the blended photo. Spring Flings and Easter Things get it HERE! I had so much fun making this kit for a tabbed album I made for a friend of DDs, it printed up just brilliantly on my epson printer using heavy weight matt paper. and it just gets better, spend $5 on LorieM Designs and you will be in the running to WIN a $5 coupon to LorieM Designs on any purchase between 24 - 26 March 2010. I am going to try better at scrapping, I am honest! I was going through my layouts the other day, sorting them out by year so I could finally print them and pop them into albums. To my horror I realised that I really haven't scrapped that many :( Now I made a promise a while back to scrap a layout for every challenge at SDK, I have sort of kept up but not enough. Now that I can see instantly how many layouts I have done per year, I'm hoping this will help focus me to scrap more. I do tend to have a light bulb moments in the middle of doing something and scurry off to start on the new idea...hehehehe. Now I haven't taken the FREEBIE! 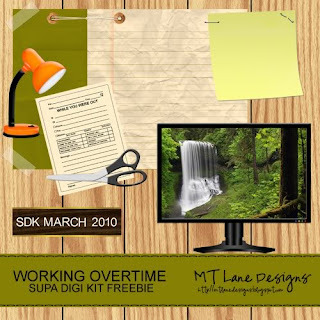 template link down yet so if you would like to grab it, hurry on over to the SDK Blog as it will be removed soon! Now isn't this just the most gorgeous layout... 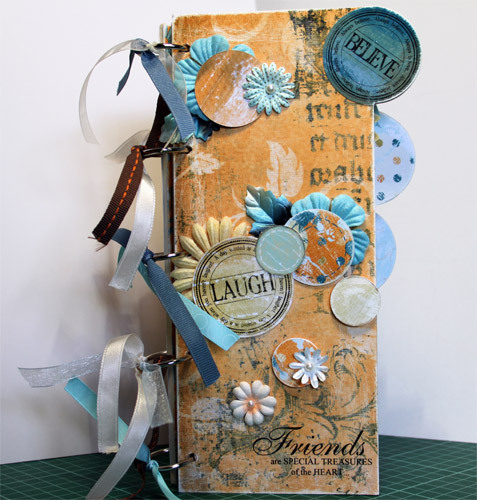 I was overawed when I saw this one pop up in the SDK Gallery the layout is by hebla72 using NH Designz Spring Flings and Easter Things. The extraction is brilliant and of course I am a cluster fan so the little cluster on the side is excellent. Nina's kit is fantastic, I don't know where she draws her inspiration from but I can't wait to see her next kit...lol. Spring Flings and Easter Things available HERE! Everybody wants to work...NO! NO! Not me! But I won't mind working too much on a layout with these delightful kits. Rubber stamps, pencils, note paper, folders, and a snack or two all combine for those work or school layouts. Ok it's share time... Hubby decided to join Weight Watchers seven weeks ago, being the dutiful wife I said I would do it with him :) Well what can I say, who knew it would be so easy...uh huh it really is so easy. Monday's are weight in day and so far todate he has lost 8.9kg (18pounds I think) and I have lost 6.9kg (14pounds if I'm converting right)... WOOT, WOOT! I am so happy for Hubby this was a big undertaking for him, firstly to admit he was over weight and then do something about it. A couple more weeks and we will have to go clothes shopping...hehehe. Everybody wants to work... NO! NO! Not me! But I won't mind working too much on a layout with these delightful kits. 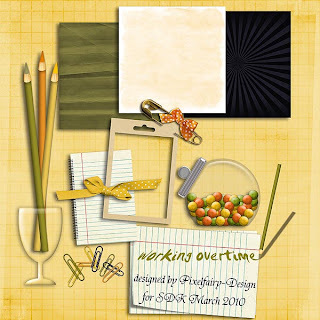 Rubber stamps, pencils, note paper, folders, and a snack or two all combine for those work or school layouts. ...here's a QP ready for your work photos, whether they be of yourself or your colleagues or hey you could just use photos of where you work...hehehe! DOWNLOAD HERE! Let me know if you like it :) I love to read your comments. All elements by me, QP for personal use only. I've been playing a bit making cards :) The Card Challenge running at SDK each month have definitely put me in the crafty mood. 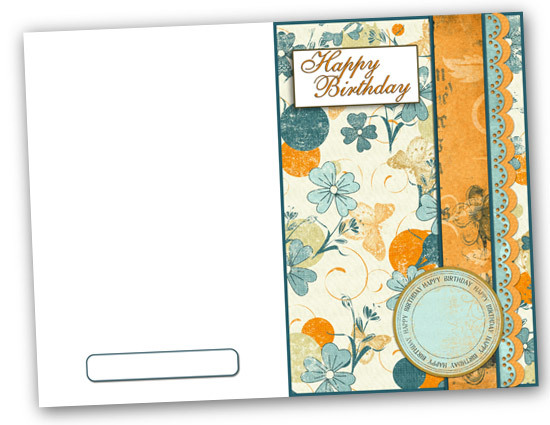 Card making has always been something I have enjoyed, so it is fun to make one in digi and one from paper. Not to mention I have had to go shopping to get more supplies, so I can make nice cards of course....hehehehe! 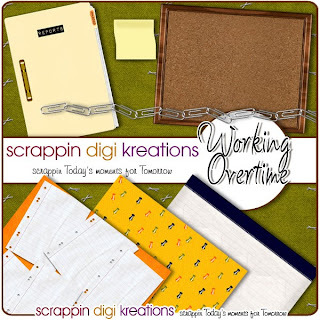 See more of Scapippi layouts here! I love the folded frames, plus the blended main photo is an excellent touch. An look at those gorgeous elements, all over a soft, elegant layout. 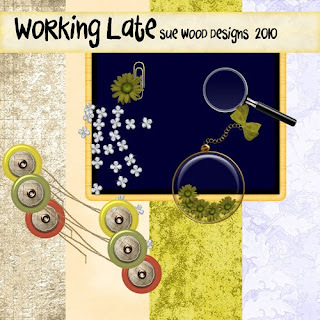 See more of Molliges layouts here! Ok, no more traveling for a bit which means I might get the freebies to you on time for FREEBIE Wednesday!!!...hehehe. 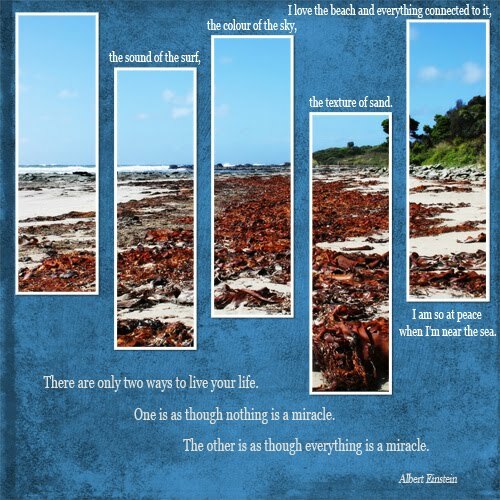 Welcome to my new look blog what do ya think??? It was really hard to come up with a new look too. I just didn't know what I wanted just that it had to be different...lol. After much deliberation I finally thought about what I like in layouts...clusters, blending and stamps, then I thought about colours that express me and that would be bright and fun. 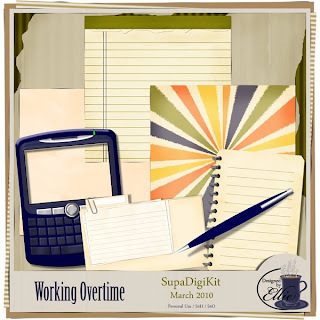 So using my 'Just Because' kit ta da.... a new look to the blog...hehehe! Meltem's layout jumped out at me while browsing the gallery. 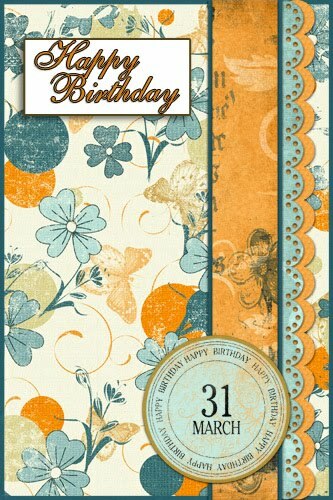 Using the collab kit 'Little Rascal' by Pixelfairy and MeKa Designs this truely is a stand out layout. Great elements, terrific extraction and I love that colour!